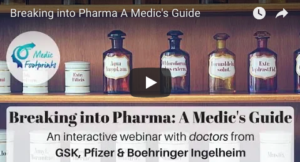 Find out how to get into Pharma in just over 1 hour by watching our online webinar recording! Have you ever wondered about a career in pharma? You like the idea, but aren’t sure where to start? Medic Footprints is delighted to present this pre-recorded interactive webinar on how to turn your aspiration into reality. So, if you’ve ever thought about a career in pharma, this is the perfect opportunity to use this insider knowledge in turning aspiration into reality. Otherwise, guests please purchase the webinar below to receive the link to the video.